This autumn mac birmingham will host Canadian filmmaker Atom Egoyan’s ambitious installation Steenbeckett. 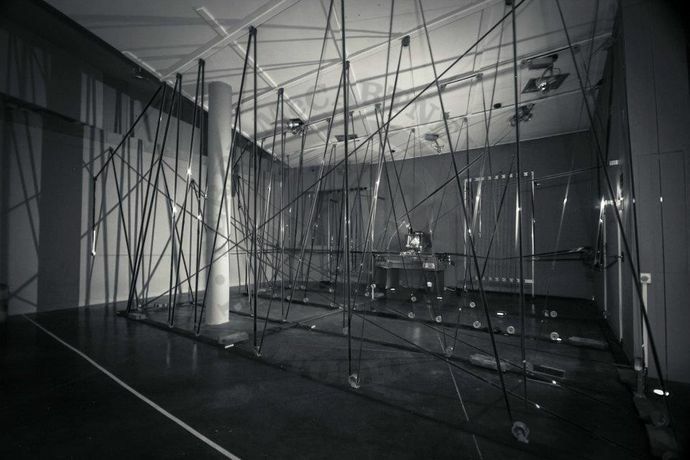 The First Floor Gallery will be filed with a forest of travelling celluloid – two thousand feet of 35mm film moving precariously and continuously around the gallery through pulley-suspended sprockets driven by a lone Steenbeck editing machine. As the 35mm film picks up dust and dirt and begins to scratch, the picture and sound irreversibly deteriorate. Meanwhile, a digital version plays in high definition in an adjacent space, remaining pristine and unaffected by the constant playback throughout the course of the exhibition. Developed from Egoyan's short film of Samuel Beckett's celebrated play Krapp's Last Tape, made for Channel 4 in 2000, and starring the British actor John Hurt, Steenbeckett explores the qualities and characteristics of analogue and digital film, and the relationship between the recorded archive and human memory. Steenbeckett was commissioned by Artangel with the kind permission of the Samuel Beckett Estate, and is part of The Artangel Collection, an initiative to bring outstanding film and video works, commissioned and produced by Artangel, to galleries and museums across the UK. The Artangel Collection has been developed in partnership with Tate and is generously supported by the Esmée Fairbairn Foundation and Arts Council England. A programme of events accompany the exhibition. Presented in association with Flatpack Film Festival as part of their Celluloid City project, events will include film screenings, workshops and discussions around the changing nature of film in the digital age. To find out more about Artangel visit here.